U.S. Route 91 (US 91) is a north–south United States highway. 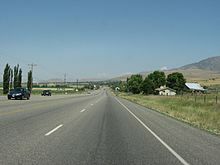 The highway currently serves as a connection between the Cache Valley area of Utah and Idaho to the Salt Lake City and Idaho Falls population centers. Prior to the mid-1970s, US 91 was an international commerce route from Long Beach, California to the Canada–US border north of Sweetgrass, Montana. US 91 was routed on the main streets of most of the communities it served, including Las Vegas Boulevard in Las Vegas and State Street in Salt Lake City. From Los Angeles to Salt Lake, the route was built along the corridor of the Arrowhead Trail. US 91 has been largely replaced by Interstate 15. A portion of the highway's former route in California is currently State Route 91. US 91's original southern terminus was at the intersection of Atlantic Avenue (historically SR 15) and East Pacific Coast Highway ( SR 1) in Long Beach. This intersection also marked the historic western terminus of US 6, which proceeded west from that intersection. East of the intersection, US 91 proceeded east along East Pacific Coast Highway to Los Alamitos Circle. In Las Vegas, U.S. 91 was better known as Las Vegas Boulevard ( State Route 604 after the 1976 renumbering of most Nevada state highways). The intersection of Las Vegas Boulevard and Fremont Street is the historic intersection with U.S. 93 and U.S. 95. Here, U.S. 466 parted ways with U.S. 91 and headed southeast on Fremont Street with southbound U.S. 93 and 95. At this intersection, U.S. 93 and 95 departed Fremont Street and turned northeast onto Las Vegas Boulevard, heading northbound with U.S. 91. A few blocks further up, at Bonanza Road, U.S. 95 turned west until it hit Rancho Drive, then continued north. U.S. 91/93 stayed aligned with Las Vegas Boulevard, which turned into Salt Lake Highway after departing the city of North Las Vegas. U.S. 91 picks up again in Black Rock in northern Washington County at exit 36 on I-15. It continues parallel to I-15 until just past exit 40, then picks up again on the other side of the freeway. This section of the road is not maintained and some of the original paving is still visible between the end of the road at Lower Taylor Creek Trailhead and when normal paving resumes near SR 144 by exit 42. The road, marked as Old US-91, then runs north through Kanarraville and into Cedar City near exit 57, merging into Main St (SR 130) until near the city border with Enoch just past exit 62. Old U.S. 91 continues to parallel I-15 to Summit. The road crosses I-15 again at exit 71 and continues its original route though Parowan merging with SR 274 at the intersection with SR 143. There is no additional signage in Parowan to indicate the original route, though historical maps show that it follows SR 271 through Paragonah. There are some frontage roads along I-15 through Beaver that may be sections of the original highway in Iron County. U.S. 91 first joined U.S. 89 in Springville at one of the oldest grade-separated interchanges in Utah (this portion is now SR 51). From this junction to Logan the two highways ran mostly concurrent. This portion is mostly intact as U.S. 89. U.S. 91 did have a unique route between Farmington and Ogden and where U.S. 89 and 91 split and then rejoined on what is now State Route 126 and State Route 26. These highways form the Main Street through Kaysville and Layton; State Street from the Layton- Clearfield border to Main Street in Clearfield though the city of Sunset turning into 1900 West at the Sunset- Roy border, then following 1900 W to a junction with Riverdale Road in Roy, then following Riverdale Road through Riverdale, and then meeting back up with U.S. 89 at Washington Blvd in Ogden. Starting just south of Dillon, I-15 was built on a new alignment that mostly parallels US 91 and crosses over it several times. In Dillon, the former route of the highway is now known as Atlantic Street and Montana Street. The highway formerly joined with U.S. Route 10 between Rocker and downtown Butte and took a northeasterly path to Elk Park Pass before it was rerouted to its current alignment east of Butte in 1980 (today's southbound lanes of I-15). It formed the main street of Boulder before I-15 was completed, and was routed through Helena along what is now Montana Secondary Highway 518 and Montana Secondary Highway 229.